Socket announced today the availability of their CHS 8Qi cordless handheld scanner. The CHS 8Qi is the second model in the progression of the compact cordless barcode scanners which are attachable to most smartphones enabling one‐handed barcode scanning. The new CHS 8Qi is designed for high‐performance allowing scanning of most 1D or 2D barcodes. An ideal choice in Point‐of‐Sale applications where 1D UPC Barcodes, 2D Mobile Coupons and Loyalty Cards need to be scanned. 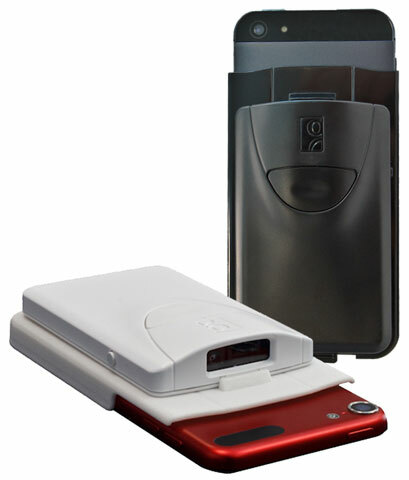 It is also suited for Mobile Ticketing where 2D barcodes are gaining popularity for security and data capacity. The CHS 8Qi attaches to most tablets, laptops and smartphones including the latest Apple iPhone, iPod touch and Android devices in a sled‐type configuration solution. The CHS 8Qi captures any type of barcode, even under less‐than‐optimal circumstances. The robust engine can read barcodes printed on labels or displayed on a mobile phone screen, high density barcodes, poorly printed barcodes, damaged barcodes and barcodes under shrink wrap. In addition, the CHS 8Qi provides a “pick list” feature that allows selective reading of a single barcode out of a set of codes that are very close together. Finally, because of its advanced illumination system, the CHS 8Qi handheld scanner makes it easy to capture any bar code on the first scan.